I recently completed a book about f inding your creativity, ‘The Artist’s Way’ by Julia Cameron. I enjoyed it immensely and learned a lot; about myself, about letting go and pampering my ‘inner child’ and most importantly, about doing the things I really want to do. With this in mind, I am excited to begin another of her books, ‘Vein of Gold’. 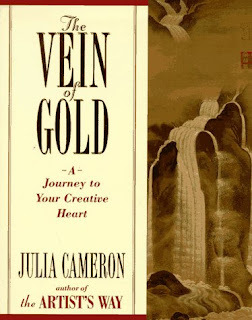 The author describes the ‘Vein of Gold’ in all of us as where we find our greatest creativity. We may be successful writers in many genres, comedy, angst, biography, but we all have our special niche where we do our ‘best work’, and that is our ‘vein of gold’. She uses the actress Merle Streep as an example. Ms. Streep has done excellent work in comedy (Death Becomes Her), musicals (Momma Mia) and suspense (Silkwood), but it is in her portrayals of ‘tragic women’ that we find her ‘luminous’. The grieving mother in ‘Sophie’s Choice’ is one of her best performances. No one would argue that her ‘vein of gold’ is to be found playing these tormented characters. Is this to suggest that she limit herself to this narrow field of films? Definitely not. I believe any actress would become bored with the same type of part each time she worked, (as would we of watching her perform them as well). Variety is a good thing, for artist and viewer alike. But when we hear of a new drama starring Merle Streep, we know we are going to see something excellent and enjoyable because these movies are her greatest strength, her ‘vein of gold’ if you will. Bearing this in mind, Ms. Cameron sets out to help us find our own ‘vein of gold’ in our chosen field of creativity by helping us find ourselves. She suggests writing ‘morning pages’, three hand-written pages each day to help you clear your mind. As you write these ‘pages’ consistently, you find that they will clear your mind, help you vent your frustrations and find those lurking fears, feelings and angers that your ‘conscious’ mind has been trying to sublimate. They are like a sounding board, or a very close friend that you can tell anything to. These are not to be seen by anyone else and are therefore a safe and sacred place to lay it all on the line, to be yourself and to express those things that you are afraid to let others, including your close friends, see. A walk a day is another tool suggested in the course. Twenty minutes a day, walking indoors or out, city or country it doesn’t matter where. The actual act of walking, the repetitious movement of body can be soothing in and of itself. The scenery along your path is to be enjoyed as well, the fragile rosebud on your neighbor’s rosebush, the brightly colored house around the corner and the lazy cat on the large porch you pass are all fodder for creativity, be you a writer, a painter or a musician. The smell of the rain on the hot cement, the sound of a lawnmower and the smell of the barbecue down the street can inspire you as well. The noise of jackhammer and construction workers can be just as wonderful as the quieter sounds of suburbia or the country. Neighbors yelling in the apartment next door, the sound of taxis whizzing by on a busy street and the distant wail of a police siren are fertile images to be used in your art as well. My first thought was that I didn’t have time for these daily walks, and in truth, I don’t. But I forced myself to make the time, and have found that I miss them on those busy days when I choose to do other more pressing things. They are like a personal treat, to myself and my ‘inner artist’, and I have found reasons ‘to do’ them; quiet time to wind down after work and before sleeping, spending time with my kids, exercising the dog, exercising myself. Funny how a change in attitude makes something ‘needful’ instead of a chore. In the first chapter of our journey of self discovery, we are asked to write a self history. The author suggests writing about your life in five year increments, 1-5 years, 5-10, and so on. Include favorite friends, toys, games, where you lived and your family members. These memories will help you not only get these things down on paper but allow you to analyze your feelings about the events that made you the person you are today. For instance, your parents may still describe the ‘long awaited and wonderful’ move to that new house in the suburbs when you were a child, and you have been blinded by their feelings on the subject. Maybe on closer inspection of your memories you were angry at having to leave your old friends and school. It might not have been a ‘happy’ decision for you. Include these observations, they are important. This exercise will hopefully jog some memories that you had forgotten, some exciting, joyful, or even painful things that have been pushed to the back of your mind. These events might be used in understanding yourself and in your writing, essentially ‘mining’ your life for inspiration. There are further exercises to help you find your own personal ‘vein of gold’, that niche where you do your best creating. There are seven ‘kingdoms’ to progress through on your journey of self and I have barely scratched the surface of the first chapter in this article. I am looking forward to the other chapters, it has been a rewarding trip so far and it’s only just begun. Wow, E! What a lovely and thought provoking essay. Thank you!